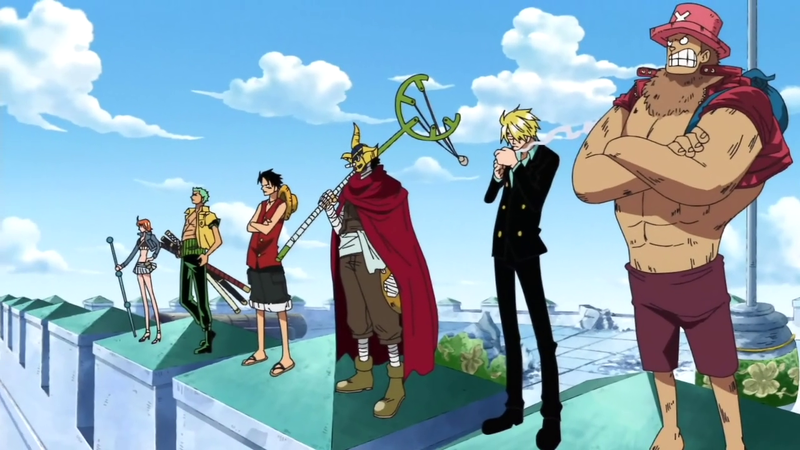 The scene where Luffy and the Straw Hat Pirates stand in a line, directly challenging CP9 and the World Government, to save their nakama (friend/comrade/crewmate), Robin. Yes, this scene is so awesome that I am posting it multiple times in the same post. The awesomeness is compounded by how they are literally lining up against the antagonists of this arc. Sure, they’ve already fought their way through hundreds, even thousands, of marines and punishment officers, but all of that was just a preamble. Now is when things are getting real. They could be fighting over a cheeseburger, and this would still be awesome. Interestingly, the Straw Hats are standing on top of a court house, and one which has hosted an endless stream of kangaroo courts. Now they have arrived, and there’s some real justice about to get served up to the ruthless assassins. 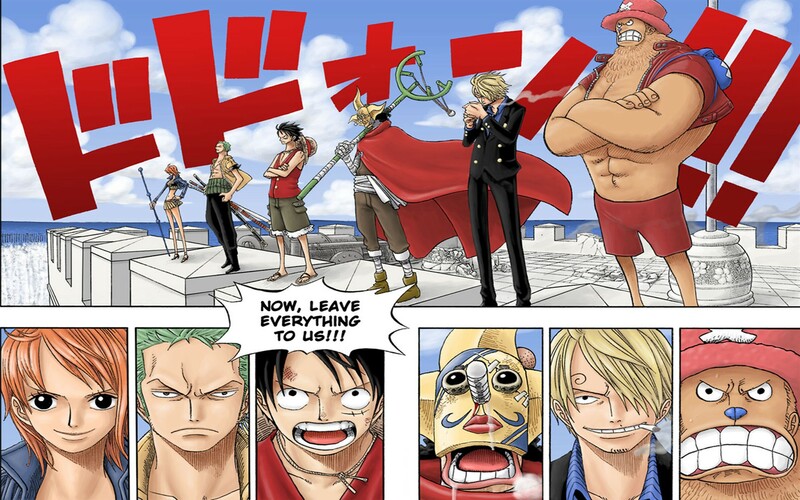 Even more, this entire arc is marked as one where the Straw Hats have not always been united. Indeed, this is probably the single arc in their entire history where they have been most divided in heart and soul. This is mostly because Usopp, in his heartache at the thought of losing their beloved ship, the Going Merry, and with some serious self-esteem issues erupting, has officially severed ties with Luffy and the rest of the crew. He even did physical harm to Luffy, though not enough to do more than hurt. But when he learned what was happening, how Robin had been stolen from the Straw Hats by the despicable agents of CP9, not to mention the means by which they coerce her, he joins in the effort to save her. He’s too ashamed to face them, so he wears a mask, but he stands with them. There’s something that just can’t be defined in words about that moment when they are all, finally united again. Not only are they fighting to save one of their own, but they are fighting to stay together. If that’s not enough, the single best part of this moment is how they manage to give it to us twice. First, they show us what it is for the Straw Hats to be united again, facing down their enemies. Then, they show us what this truly means to Robin, whom they are trying to rescue. We learn her story, how she once had a happy life, how a truly traumatic event condemned her to a live alone, always hunted, betrayed again and again and again. This began when a massive military force, capable of wiping out nations, burnt her homeland to the ground, along with all her family, friends, and everyone she knew: dead. Her happy life was ended, and she never found a true friend in the two decades which followed. Everyone turned on her at some point. She was alone, and eventually lost the will to live. Then Luffy saved her life and let her join his crew. With them, she found friends, and a purpose. When CP9 dredged up the worst nightmare from her childhood and threatened to unleash the military on the Straw Hats, she surrendered, believing they, and the world, would be better off without her anyway. She has been told, from a very young age, that her very existence is a sin. They even went so far as to say, with their actions, that if the world were their enemy, then so be it. Can we truly comprehend just how much that means to her? After a lifetime trapped in darkness, at last… light! After so much time… alone… she has friends! Comrades who will defend her no matter the approaching danger! Crewmates to take her away, to the sea, to live in freedom! These are her nakama! For the first time in a long time… she fights to live! There’s really nothing more profound than that. And, to top it all off, they look really cool. This entry was posted in 30-Day Anime Challenge, Anime and Cartoons, Challenge Accepted and tagged Chopper, CP9, Enies Lobby, Luffy, Monkey D. Luffy, Nami, Nico Robin, One Piece, roronoa zoro, Sanji, Straw Hat Pirates, Straw Hats, Usopp. Bookmark the permalink. I chose this scene as my most epic scene when I did this challenge. The effects of this event is so powerful that it still reverberates throughout the entire series until now. 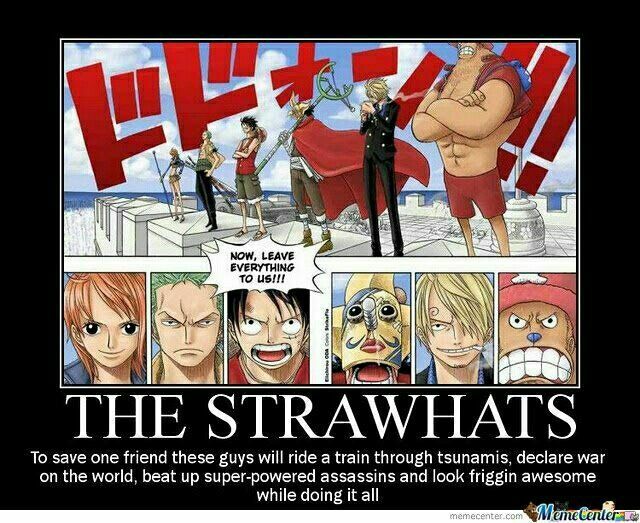 It also cemented the Straw Hats status in the pirate world. That’s just so cool. Besides all of these, however, I agree with you that the effect within the crew is more dramatic. It drew them closer, more intimately, with each other. It also gave Nico Robin a new reason and purpose to live and become an official member of the crew in every sense of the world. Great post!